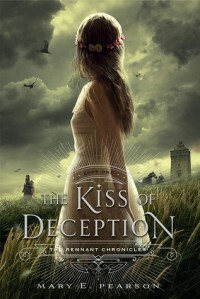 Kiss of Deception is the start of Mary Pearson’s new series and I loved it! Lia is fantastic and spunky and badass without tripping over any tropes. She is fierce and knows what she wants, and will do as she wishes in spite of how it affects the plans of others. The book starts with Lia’s most influential, and most rash, decision: to flee her imminent wedding to man she has never met. This prompts the other two main characters into action, and Rafe and Kaden both plan to seek Lia out for their own particular reasons.